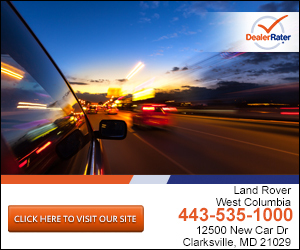 Land Rover West Columbia is your Land Rover dealership in Clarksville. We have a huge selection of Land Rover vehicles including LR4, Range Rover, Range Rover Evoque, and Range Rover Sport. If you are looking for a pre-owned vehicle, then you have come to the right place. We have a wide selection of pre-owned vehicles all of which have the high level of quality that you should expect from Land Rover West Columbia. If you are looking for Land Rover parts or service, then we can help you out there too. We have been operating in Clarksville for over 14 years, and we vow to always treat our customers as honored guests in our showroom. We serve all the surrounding areas including Ellicott City, Baltimore, Silver Spring, and Columbia. Come to Land Rover West Columbia today where nobody beats a Jim Coleman deal! "To the point and, pleasant and professional"
My salesman, Steffan, was extremely knowledgeable, professional and helpful. PJ always makes sure I am well taken care of when I bring my truck in for service. I am given always given a loaner to drive while vehicle is at the shop. Thanks, guys! I love my discovery!